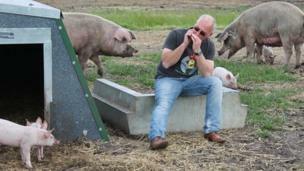 A Suffolk farmer claims playing live music to his pigs makes them more relaxed, calm and content. 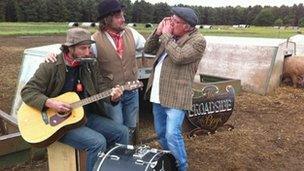 Mark Hayward, of Dingley Dell Pork near Wickham Market, plays harmonica and invites the farm's 'house band' The Broadside Boys to perform. He said: "The pigs respond to your mood and music and talking to our animals is a key part of that." The RSPCA said its survey of 249 farmers showed a majority felt music and talking improved animal welfare. The charity commissioned the survey for its Freedom Food campaign. Dr Marc Cooper, RSPCA farm animal scientist, said: "Chatting to farm animals may sound daft but, like our pets, farm animals are intelligent, sentient beings and respond well to positive interaction." Mr Hayward has joined up with local folk band The Broadside Boys to record The Dingley Dell Song. He said: "When the band isn't here we have music on all the time coming from the tractors or my truck. "This creates a great working environment for the stockmen too as it's really important to be relaxed and calm around farm animals. "I chat away to my breeding sows all the time although the piglets don't seem to want to stay still for long enough to listen."